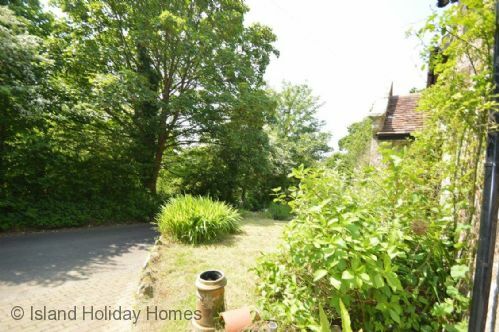 Delightful cosy 16th Century Stone Built Cottage is in the Shanklin area of the Island with its beautiful sandy beaches. Situated in a pretty walking area, surrounded by ancient woodland with many nature walks in every direction. The seaside Town of Shanklin is 1.3 miles away and there is a bus stop within a short walk. You really can escape and relax in its beautiful surroundings enjoying a tipple or a hot cuppa in the delightful stone courtyard garden. 1 Apse Castle Cottages has been completely refurbished and is furnished and equipped throughout to a very high standard. There are exposed wooden floors, a stunning Inglenook fireplace with Log Burner and charming features such as exposed beams to the lounge ceiling. 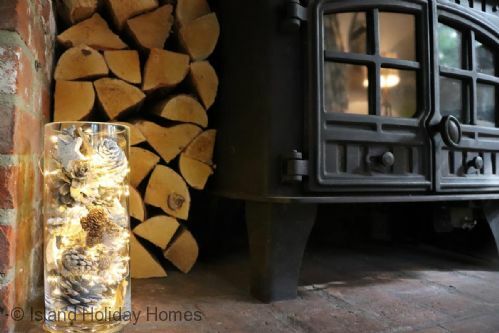 The lounge is the perfect place to relax with its Log Burning Stove and is furnished offering a comfortable sofa, chairs, television with freeview. There is a cottage style kitchen with an electric range induction cooker, belfast ceramic sink and original quarry tiled floor. It has everything you need for your stay including microwave, fridge, freezer and dishwasher. There is a separate utility area with washing machine. You will also find a luxury bathroom with Slipper bath, WC and pedestal wash basin downstairs with cosy underfloor heating. Upstairs, there are 3 lovely presented bedrooms. One double, one twin and one single with antique wardrobes adding further character to the rooms. There is a luxury shower room upstairs with a Mira power shower, WC and pedestal. Telephone and Wifi is provided free of charge. Outside there is a lovely enclosed Courtyard offering an outside dining area. There is driveway parking for two cars. For holidays of 2 weeks or more, the property will be cleaned on Saturday mornings at 10.30am. Regular buses are accessed from the end of the road, within a few minutes walk. Bedroom 1: Master with Double Bed, beside cabinets, wardrobes & chest of drawers. Duvets and pillows on all beds, Bed linen & Towels provided. Please bring own beach towels. The South of the Isle of Wight incorporates some of the most exciting coastline from long stretches of beach with hidden fossils and exposed dinosaur footprints, to rugged cliff tops with exhilarating views and historical monuments and pretty villages steeped in history, the inspiration for artists and authors old and new. Blackgang Chine is a must for all the family with a fantastic variety of activities for all the family to spend a great day out. Themed areas like Frontierland where you can play Cowboys and Indians in a full sized Cowboy Town, and rides like Waterforce where you can choose the fast 'overflows', or the scary 'plug-hole' - you'll have to see it and experience it to believe it! Superbly situated beside the sparkling waters of Sandown Bay, the twin resorts of Sandown and Shanklin have delighted generations of holiday-makers for over 150 years. Along Culver Parade you'll find tennis, bowls, Go-Karting, crazy golf, a pitch and putt course, the Tiger Sanctuary and Dinosaur Isle Museum. At the southern end of town the Heights Health and Leisure Base has indoor swimming pools and further inland is a fine 18 hole golf course. With its charming thatch-roofed cottages and winding main street lined with tearooms, Godshill is the quintessential English Village. Travelling South to Wroxall there's the Donkey Sanctuary and Appuldurcombe House now offering Owl and Falconry displays. Visit Chale Green Deli and Coffee shop and on to the Southern most tip of the Island St Catherine's with its ancient Pepperpot. Ventnor Botanic Garden provides a lovely walk and then lunch at their very successful café. There are coastal paths around the Island and this section features the Isle of Wight's famous chines. Whale Chine is the most spectacular in a series of Chines along this stretch of coastline. Devil's Chimney provides an exciting walk through enchanted woodland down to the beach; Chale Bay is stunning; Wealdon Beds which have yielded fossilized remains of dinosaurs. With features like St Catherine's Lighthouse many feel this section offers the best walking and views of the entire Isle of Wight. Sandown and Shanklin on the south-east coast share a wide crescent of golden sand, with safe swimming, water sports and a range of bars, pubs and cafés. The southern stretch, below Shanklin Chine, is the quietest and most attractive. Ventnor has a wonderful Mediterranean light and, like Sandown and Shanklin, an enviable sunshine record. Steephill Cove is its prettiest beach, a peaceful little bay with a good beach café. Reach it via the coastal footpath from the Botanic Gardens, or La Falaise car park in Ventnor. Try the local seafood, in particular crab, lobster, haddock dishes. The vast majority of pubs are highly geared up for food and usually the portions are on the large side. Fresh crab in particular can be tasty from beachside cafe's and can also be purchased from the fisherman at seafood huts selling direct, two places spring to mind: Ventnor Fresh Crab Beach Hut and a fisherman's house at Steephill Cove next to the café'.